With the introduction of the Yeti line back in 2014, the bar was set. 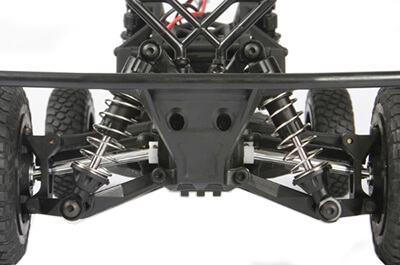 Axial introduced a vehicle that featured independent front suspension(IFS) with a floating solid rear axle, something commonly reserved only for the full size off-road realm. This time around, the decision was made to make things a wee bit smaller, while still providing a high level of performance. 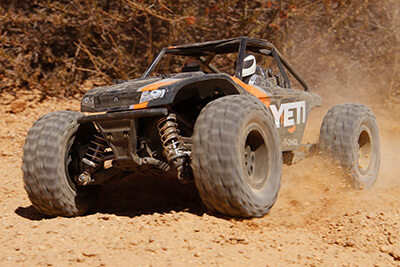 Enter, Yeti Jr.™ Rock Racer 1/18th Scale Electric 4WD - RTR. We’ve taken all that you’ve come to love and appreciate in the Yeti chassis, but shrunk it down to 1/18th scale. It’s powered by a 380 sized brushed motor which provides the perfect amount of torque and speed for this tiny rock racing monster. Also featuring a bespoke all-in-one programmable Tactic ESC and receiver, paired with a 3-wire micro high torque steering servo. With the Axial Yeti Jr.™ Rock Racer the goal was to build a simple, fun, and easy to drive Yeti that anyone can handle. The hardest part about the Yeti Jr.™ Rock Racer is making sure you have enough battery packs charged in order to keep the adventure alive! In a fast paced world where space is limited and ease of use is paramount, charging the supplied Onyx 6-cell NiMH battery needs to be simple and convenient. This is where the Onyx USB NiMH Charger comes into play. It’s small, compact, and easy to operate. The Yeti Jr™ is equipped with an Independent Front Suspension (IFS) system to help maintain high-speed stability when running through a diverse range of terrain. The IFS system allows you to better control the intended direction of travel at high speeds when one side is adjusting to overcome road obstructions. The Axial Yeti Jr™ has no micro gears, instead the drivetrain features 48P gears, which is not only a robust design but also expands the number of possible gearing configurations. The spur gear is mated to a 15T metal pinion gear for optimal gearing. 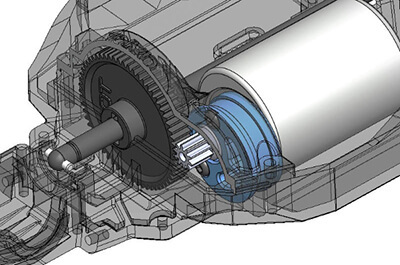 Adjusting the gear mesh to accommodate different sized pinion or spurs gears has never been easier with the help of a cam style motor mount design. The front top plate secures the cam motor plate in place and all screws thread down into the chassis, eliminating the need for extra long hex drivers in order to secure the motor and gear mesh. Based on the popular Method 105 machined wheels, these officially licensed wheels are dressed in an aggressive all black style to give your Axial Yeti Jr™ Rock Racer that scale look. In the full-size off-road world the BFGoodrich is the winner of more rock-crawling championships than all other tires combined (Race spec tire, Years 2004 through 2008). The Axial version captures the same aggressive look you’ve been waiting for, just smaller in size.